It Takes Two: Port tools & Thread Mills – Scientific Cutting Tools, Inc. When machining a port, it is necessary to cut a thread as well. The port finishes the hole whereas the thread must be created using a TAP or a thread mill. Thread mills are particularly effective for creating a thread close to the bottom of a blind hole, unlike TAPS which tend to create imperfect and incomplete threads. Use our pairing guide attached to this email to make Scientific Cutting Tools your one stop shop for all of your porting and threading needs. All of our tools are made from premium sub-micron carbide and are offered in both coated and uncoated iterations. 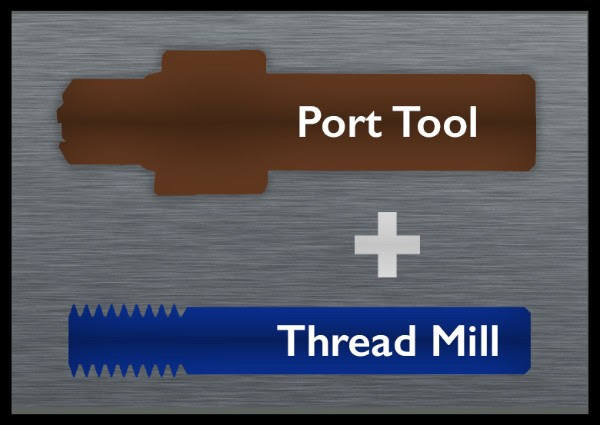 We also offer a thread mill code generator on our website which makes it easy to program our tools to your specific application. If you need further help with programming our port tools and thread mills we offer extensive technical support in both English and Spanish. Contact Todd White at twhite@sct-usa.com or 805-584-9495 for more information or for all of your technical support needs.